WELCOME TO THE OFFICIAL YBPC WEBSITE!! 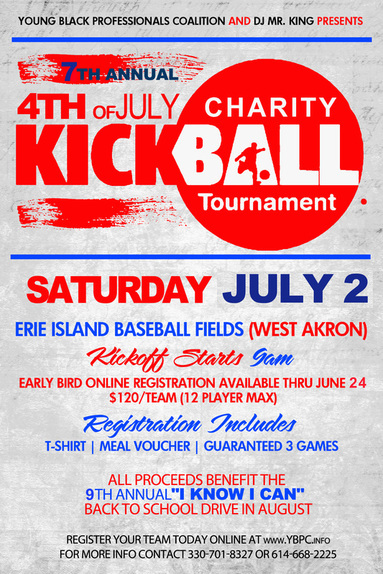 The Young Black Professionals Coalition and DJ Mr. King will be hosting its 7th Annual Charity Kickball Tournament Saturday, July 2 at Erie Island Fields in Akron, Ohio. Team registration and check-in begins at 8:00 am. The first game will take place at 9 am. There is an early bird $120 entry fee per team through June 24 ($150 per team after). All proceeds raised throughout the tournament will benefit the 9th Annual “I Know I Can” Back-To-School Drive in Akron Sunday, August 23. If you are interested in making a donation or would like more information on this event please contact Steve King at 330-701-8327 or Eric Fletcher at 614-668-2225. 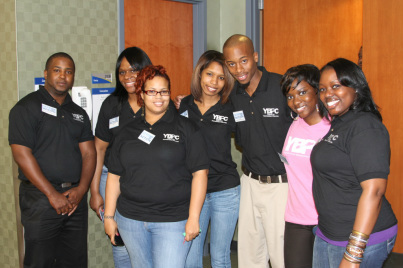 You may also send an email to ybpcinfo@gmail.com to receive more information about future community and networking events the Young Black Professionals Coalition will be hosting.